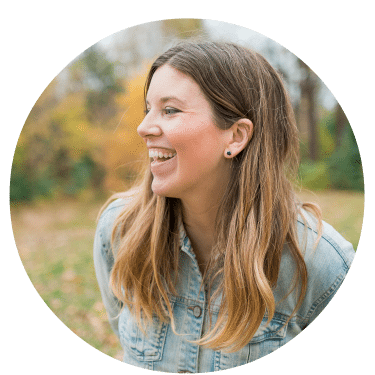 If you’ve been a reader here for a while, you’ll know that painting thrift store furniture is something I do for just about every room makeover I do. It’s a great way to get affordable furniture that looks amazing and custom in a space. 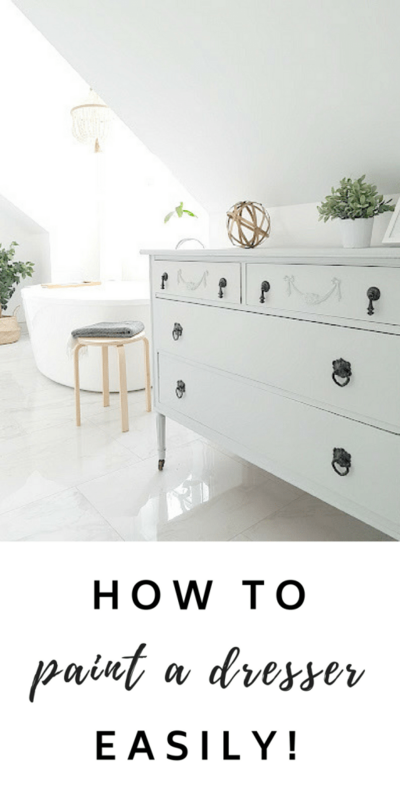 So let’s talk about how to paint a dresser. And you guys, I just discovered the BEST paint for easy furniture makeovers. 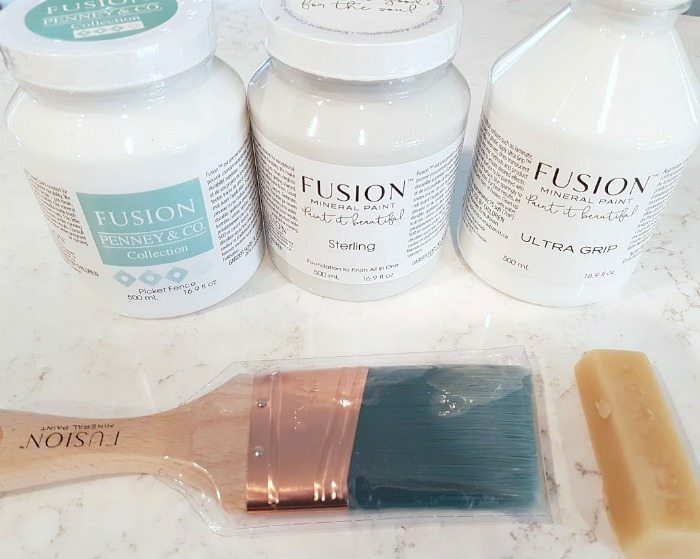 I wanted a matte gray paint for a dresser makeover in our bathroom and decided to try a new brand to me: Fusion Mineral Paint. And spoiler? It blew me away. 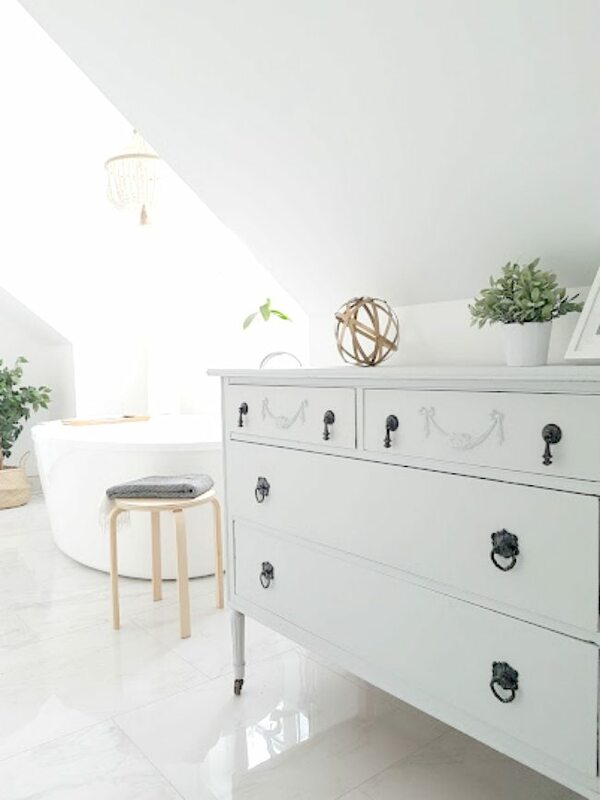 If you keep your eyes peeled on Kijiji, Facebook Buy and Sell groups, or just on garbage day, you will undoubtedly come across a major furniture score before too long. A solid wood dresser is always a great investment. 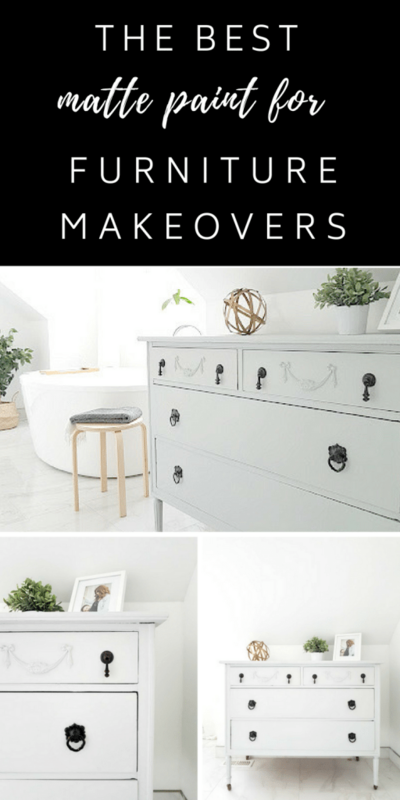 I recently came across this pretty dresser for $40, and knew it was going to be perfect for our bathroom makeover. I go for something that’s dovetailed and well made, since you know it will last the test of time. 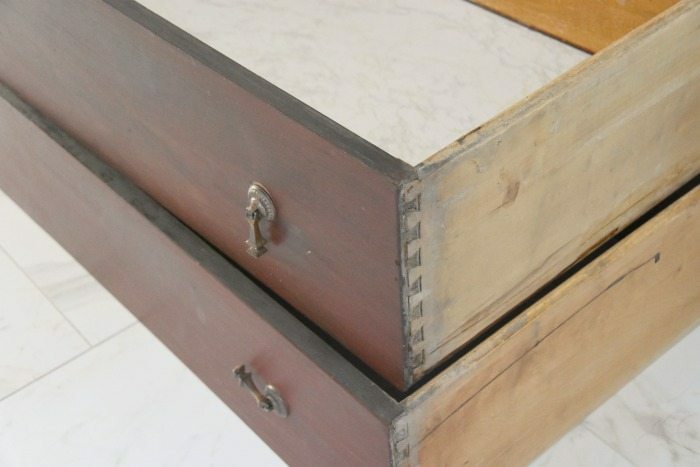 See how those drawers are solid wood, and have those notches at the corners? Waaaaay better and long lasting than laminate. 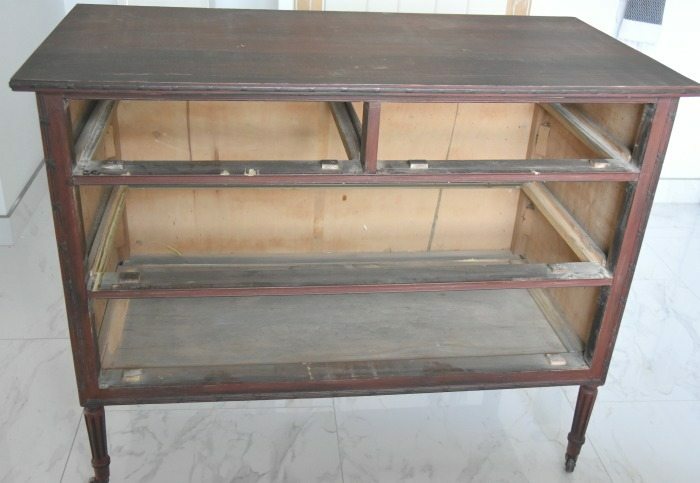 Usually dressers just need a little clean up and TLC. I have tried many different paints before for furniture. Chalk paints, regular latex paint, the works. 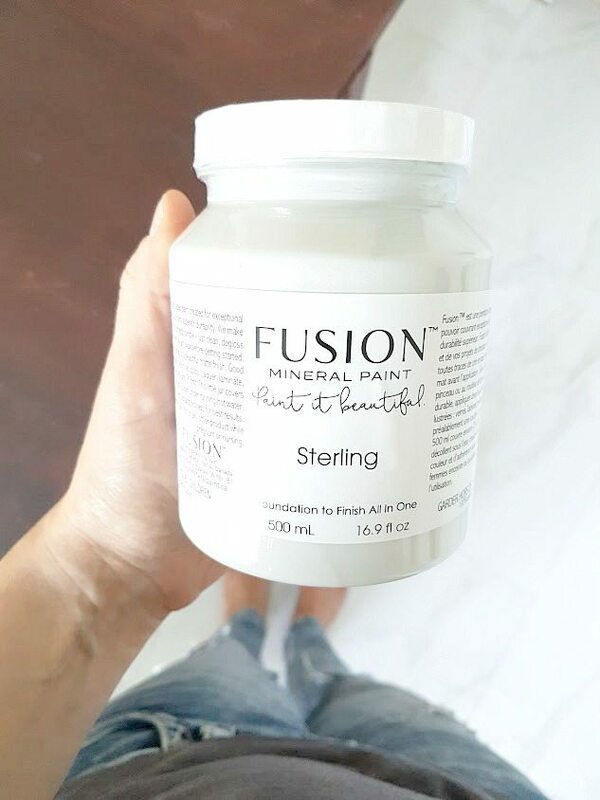 Fusion Mineral Paint was new to me, but I had heard so many blogger friends chatting about it and wanted to give it a try. I decided to reach out to Fusion Mineral Paint to see if they would partner with me on this project. They sent me paint to use, but did not pay for me to write a review of any kind. 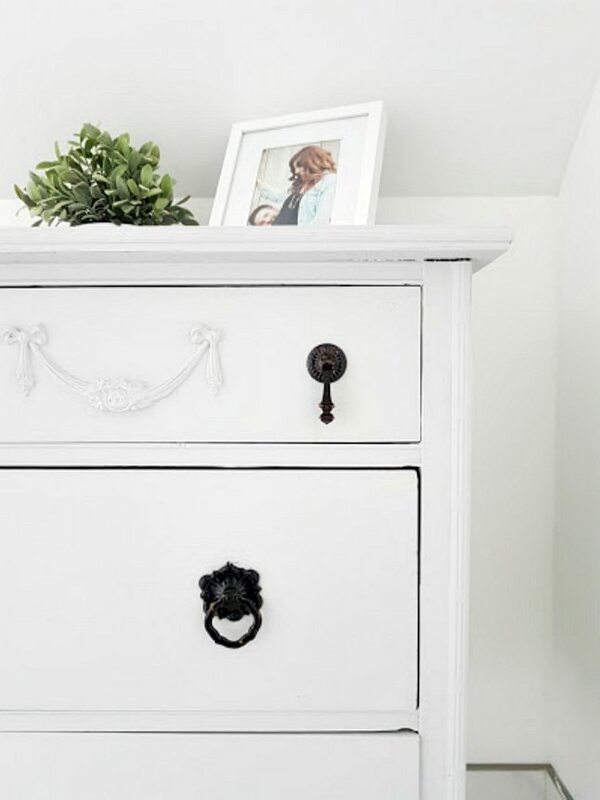 How to Paint a Dresser – This Paint is Amazing! Let me tell you… I have found my paint soulmate. For lazy DIYers like me, this paint is AMAZING. 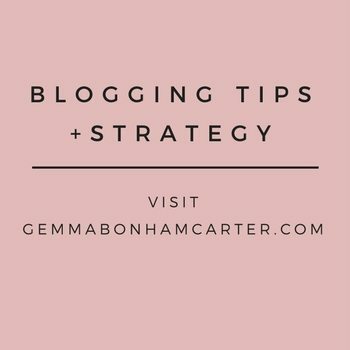 You don’t have to do much prep work and it just goes on SO easily and quickly. I barely even needed two coats, and it was probably the fastest furniture paint project I have ever done. You can distress easily with Fusion too, if that’s your thing. I wanted a matte gray for this dresser (no distressing) and the paint nailed it. I used the colour ‘Sterling‘. I used the Fusion brand paintbrush since it is specifically made to go with their paint, and I would recommend doing that. It went on amazingly and without any visible paint brush strokes. Count me as a huge fan! I spray painted the existing hardware black to match the other black faucets and doorknobs in the room. I may get all new hardware at some point, but for now this totally works! If you have a piece of furniture that needs painting, take my word for it and try Fusion. You won’t be disappointed!! Does it apply similar to a chalk paint and have a similar finish? Similar matte finish. Didn’t require the same level of work that I found chalk paint did! Project went way faster! How many coats did it take? Love the black knobs! Wow!!! It turned out beautiful!! I need to try this paint. I am super impatient with projects. It is definitely my biggest downfall. Barely needing two coats sounds like a dream! Me too!!! I call it #lazygirlDIY :) That why I majorly loved this paint. 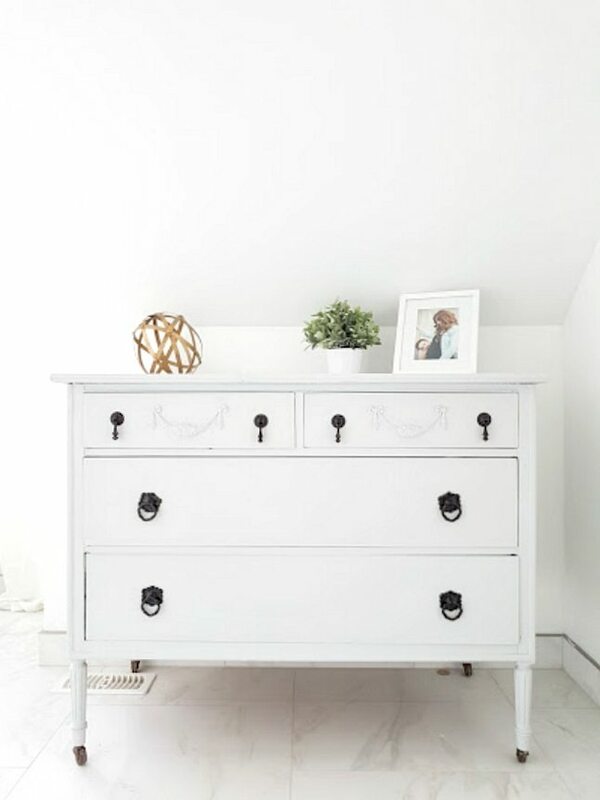 Goodness that’s a gorgeous dresser! !! And those pulls are amazing! It’s funny to me how some people can’t see beyond the current condition of a piece and not its potential – what you did was stunning!!! I have an old dresser, one color, a night table another color, and my bed is another color. I don’t want black, although at the end, I think that I would consider it. I would love to make it a nice bedroom set. I have an efficiency Apt and is painted in a yellowish color.. what color do you think it would go best? Can you give me an idea? Oh, I also have a black metal futon?! !